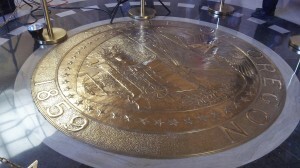 The Oregon seal under the Capitol dome. For two and a half hours Thursday morning, witnesses at a state Senate committee hearing in Salem disagreed about SB 1551, which would expand the background check required in gun transactions to private sales and gifts. Chairman Floyd Prozanski, D-Eugene kept track and said the Senate Judiciary Committee heard from 20 witnesses for the bill and 22 against it. You’d think all that talk would have uncovered a single fact that could serve as a believable reason to adopt this bill. But no such fact emerged. 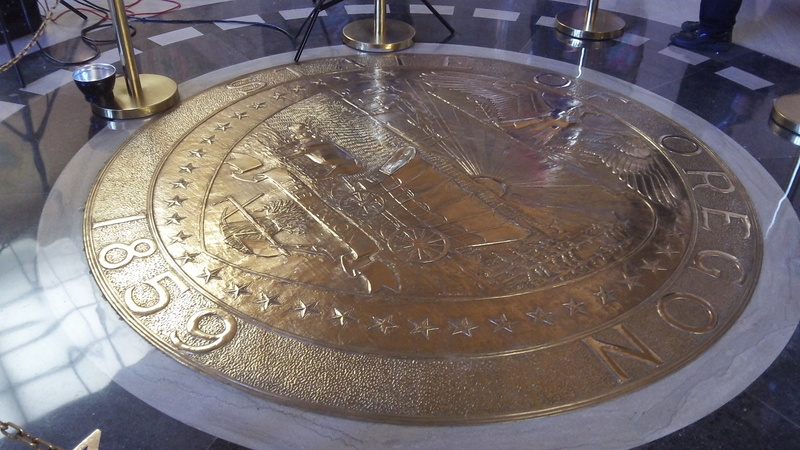 People listening and watching — you can do both on the legislature’s website — heard Navy Capt. Mark Kelly, the husband of former Arizona Congresswoman Gabrielle Giffords, make an eloquent appeal for upholding the Second Amendment. He said neither he nor his wife, grievously wounded by an insane murderer who killed six and injured several more, would ever relinquish their guns. But he was for the bill as a common-sense move to curtail gun violence. This even though, in answer to a question by Albany’s Sen. Betsy Close, he said that yes, the Tucson killer had passed a background check. Backers of the bill kept citing mass shootings — from Thurston High and Aurora, Colo., to Clackamas Town Center and Newtown — completely sidestepping the fact that those shooters had either passed background checks or used guns they had not bought themselves. The testimony backing the legislation was heartfelt but not relevant to this bill, and the key information was missing: How many legitimate gun sales not covered by the existing background-check requirement are there in Oregon now, and how many of those lead to crimes? At least a partial answer could be obtained if the legislature directed law enforcement to investigate how felons arrested for possession of firearms got them, and to report the results.